AsylumConnect has been named to the Fall 2018 Unfunded List. 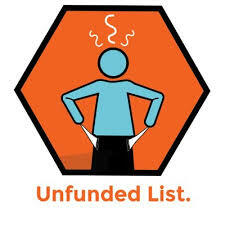 The Unfunded List is a nonprofit devoted to connecting "unfunded" proposals (defined as organizations with less than a $5 million annual operating budget) with funders. Twice a year, the Unfunded List team publishes a list, in which they feature the top proposals which deserve more funding. We received our largest pool of proposals over the summer of 2018 and our committee of expert evaluators reviewed them diligently this past fall. Our review culminated with the first ever Evaluator Summit at George Washington University. The Summit gave us the opportunity to connect some of our applicants directly with reviewers as well as to build both fundraising and evaluation skills. In addition to AsylumConnect, National Medical Fellowships and Cerebral Palsy Alliance Research Foundation were named to the Fall 2018 Unfunded List. AsylumConnect is thrilled to be named to this list at such a pivotal moment in the United States. LGBTQ asylum seekers deserve safety. With more funding and resources, AsylumConnect can ensure that there is never a time when someone does not know where it is safe to go for help due to their LGBTQ identity or immigration status.